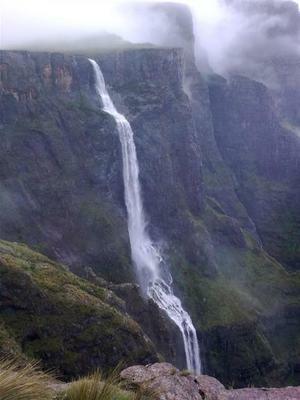 I am convinced that Tugela Falls is taller than Angel. Not as a single drop, but counting its five tiers which are very close to one another. Everyone I have spoken to who has seen both says Tugela looks taller to the naked eye, and evidence agrees with this assessment. With the Angel Falls the quarter mile of cascades after the main drop is counted, which adds hundreds of feet in height, as is the 60 foot fall at Mirador. That seems wrong to me and if you counted the same at Tugela it would be way over 1000m. See topographic maps on http://www.mytopo.com/maps/ and you can see that Tugela falls around 1km. Angel in total to Mirador Laime actually looks closer to 807m, which is what is usually cited as just one drop. Tugela starts falling at an altitude of 2972m, and it only stops as a fall at around 1960m altitude. See https://en.wikipedia.org/wiki/Tugela_Falls#Height_controversy for more detail. But seriously, look at detailed topographic maps and it seems pretty obvious, Tugela is taller than Angel. Still think Angel is amazing, but everyone interested in record waterfalls should be informed of this. You should visit Tugela in South Africa. It is very easy to get to and is very beautiful indeed. It falls of a cliff called the Amphitheatre in the Drakensberg’s Royal Natal National Park, and in the summer rainy season you can actually see four waterfalls at once falling off this cliff, all over 800m tall. I think only Tugela is permanent, but the Bilanjil River must almost be as well and its fall is nearly as much as Tugela. I think people should remeasure as accurately as possible, because the tallest waterfall in the world is almost certainly in Africa.